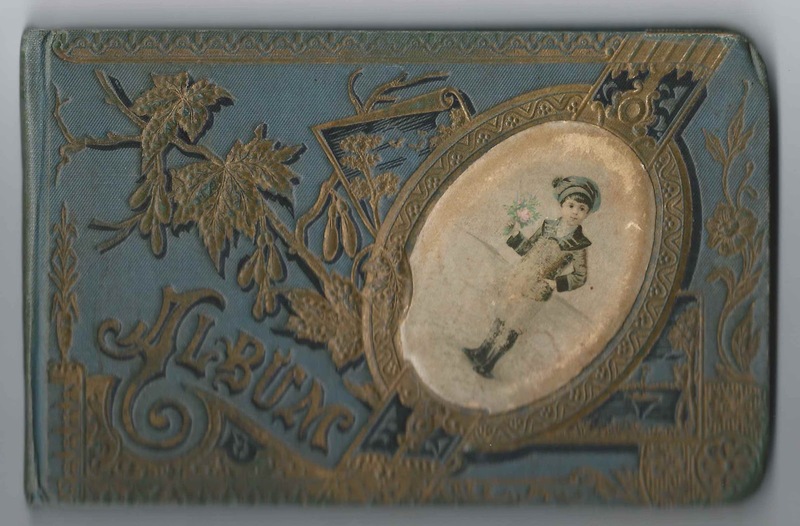 1880s/1890s autograph album that belonged to Mabel Agnes Gerry of Dover, Maine. Dover, Maine, and Foxcroft, Maine, located across the Piscataquis River from each other, merged their municipalities into Dover-Foxcroft, Maine, in 1922. The album is approximately 7-1/4" x 4-1/2" and contains the sentiments of 43 of Mabel's relatives, friends and schoolmates at Bear Hill High School at Dover, Maine. An alphabetical list of the signers in the album appears at the end of this post. Several signers gave their residence as Dover South Mills, which I believe was located in the area of Branns Mill Pond or along its outlet, Black Stream. Mabel Agnes Gerry was born about January 1881 at Dover, Maine, the daughter of Ambrose B. and Clara E. (Green) Gerry, who were born at Dover, Maine, and Sebec, Maine, respectively. Mabel's paternal grandparents, Eben O. and Betsey A. 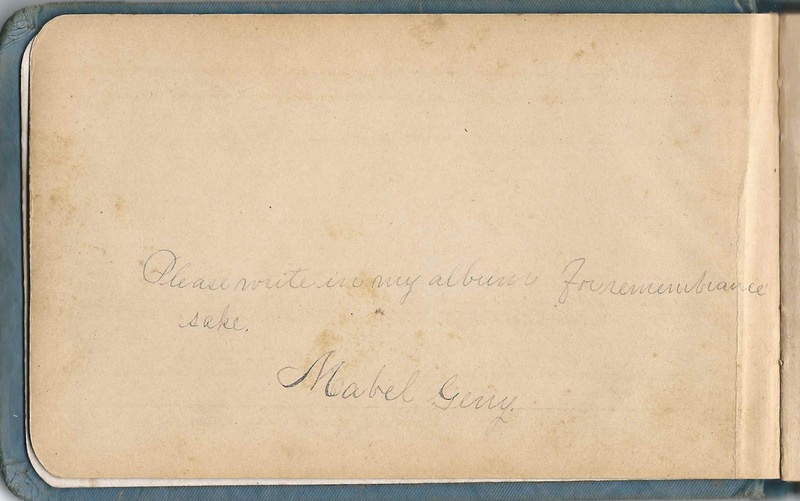 (Bartlett) Gerry signed successive pages in the album. Eben, or Ebenezer, and Betsey were born in Waldo County, Maine, at Freedom and Montville, respectively. 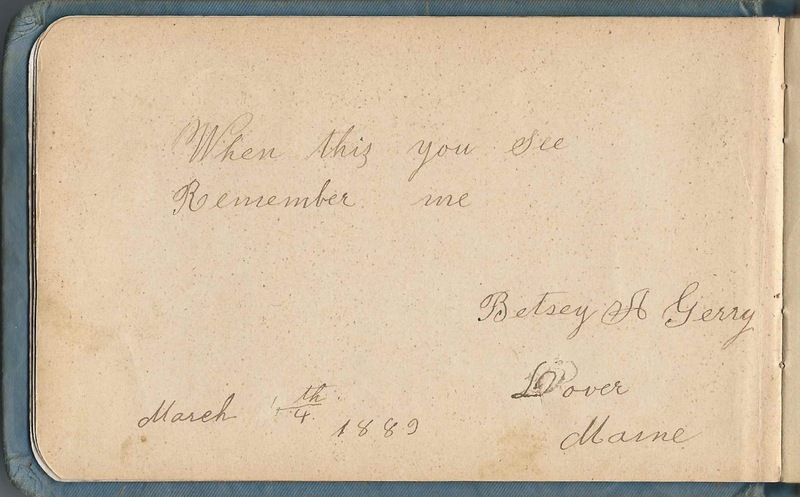 They moved to Piscataquis County, Maine, and were living at Dover, Maine, when Eben signed his page on March 3, 1889, and Betsey the following day. On 7 January 1905 at Dover, Maine, Mabel Agnes Gerry married Wendall Harold Hall, son of John Taylor Hall and Adelle Elmina Mansell/Mancell. 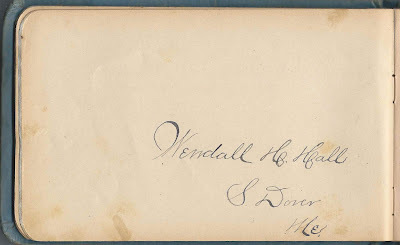 Wendall had earlier signed a page in Mabel's album. The couple lived at Dover, Maine, and raised a son and two daughters. Wendall was a rural mail carrier. 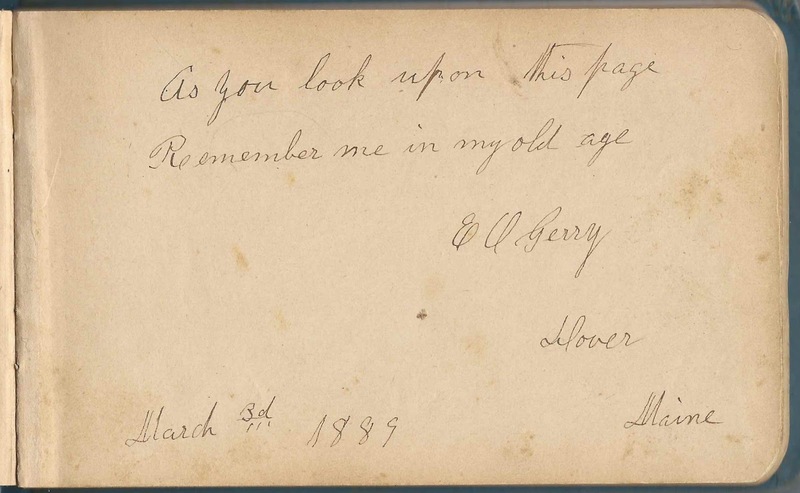 E. O. Gerry of Dover, Maine, signed March 3, 1889. 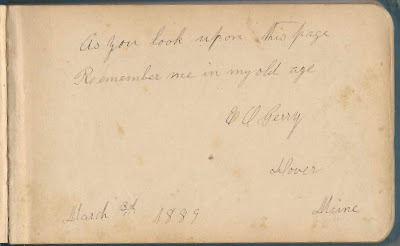 Mabel's paternal grandfather Eben O. Gerry; his wife Betsey signed the following page. 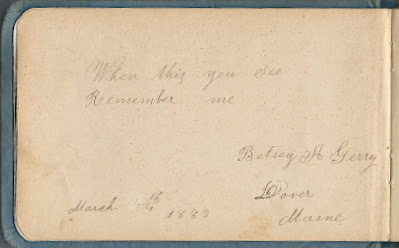 Betsey A. Gerry of Dover, Maine, signed on March 4, 1889; Mabel's paternal grandmother Betsey A. (Bartlett) Gerry. 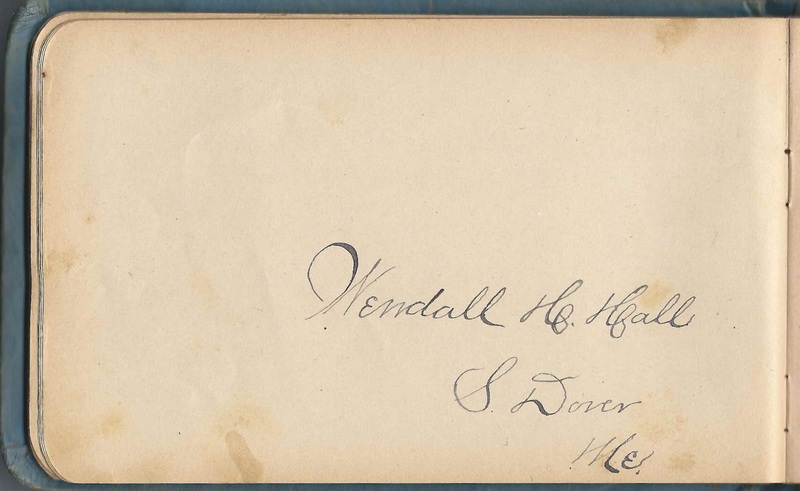 Her husband E. O. Gerry signed the preceding page. 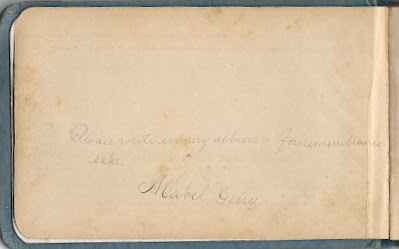 Mary I. Gerry of Alton, Maine, signed at Foxcroft, Maine, on February 26, 1893. She married Albert J. Ham at Dover, Maine, in 1906. Jacob Lerner; someone penciled in "Dover, Maine"
Susie Sanborn of South Dover, Maine; Mabel's cousin. There were several Susie Sanborns in the Dover-Foxcroft, Maine, area in that era. F. P. Stowe, signed on January 2, 1889. Not sure of surname; could be Stone or Storey, etc., but since there was a Frank P. Stowe at Dover during the same era, the signer could be he.